StyleRocks was founded in November 2011 by Pascale Helyar-Moray, who came up with concept of StyleRocks when she was frustrated by the lack of jewellery alternatives online. Pascale was 8 months pregnant with twins when her husband very generously offered to buy her a present to celebrate the twins’ arrival – the ‘push present’. However, as she was so big, getting to the nearest jewellery store was a real challenge. So she went online and found herself wanting to customise everything she found, to make it right for her in terms of the metal colour or gemstone. It seemed fundamentally wrong to her to have to settle for something that wasn’t right, especially when jewellery is such personal expression of style. Frustrated at the lack of options available, Pascale and her husband abandoned their jewellery search. After the twins’ arrival and relocation back to Australia, Pascale started to think about what a return to work might look like. Deciding that she wanted a business that harnessed her passion for jewellery, and could juggle it around motherhood, StyleRocks was born. ...it's been an amazing journey. StyleRocks has been fortunate enough to win a series of awards, including a Microsoft BizSpark Plus Scholarship, be selected among a handful of startups for the prestigious DEMO Asia 2012 event, finalist in a series of awards including the City of Sydney Business Awards, Startup Smart Awards and the Cool Company Awards. We've been lucky enough to have received a ton of media coverage. You can read more about that on our media page or on the StyleRocks Wikipedia page. 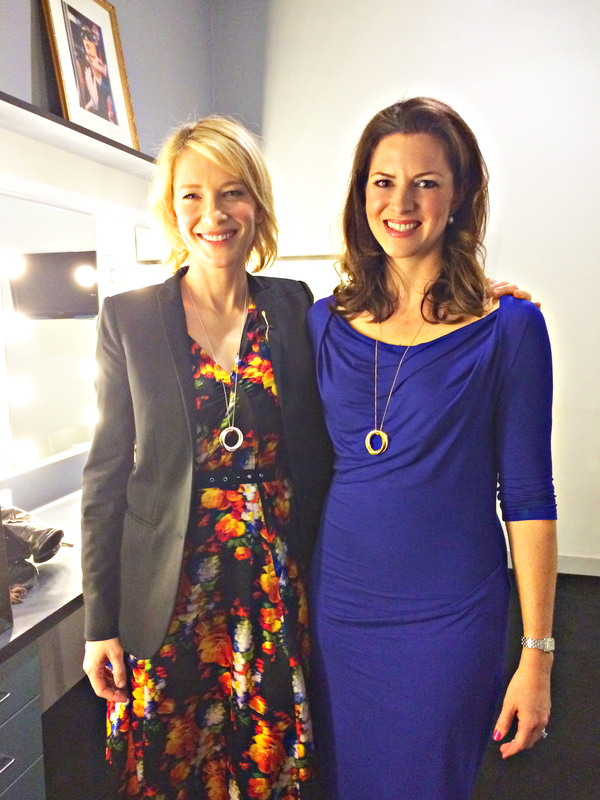 A number of celebrities wear our jewellery; some local - such as Sydney Fashion Blogger, Micah Gianelli and Natarsha Belling - as well as some international celebrities such as Cate Blanchett (picture below, wearing a StyleRocks Russian Rings 'Charlotte' Necklace) & Dannii Minogue. But it's our customers who really make the difference in our world. We love creating beautiful jewellery for them. Customers typically write about how much they love our jewellery - and you can read their reviews on the various jewellery product pages. Whether it's the $17,950 diamond drop earrings or the $90 double pearl tribal studs, most customers rate our jewellery a 5/5. You can watch our StyleRocks customer testimonial video below. Customisation is next-generation of personalization. Personalization has historically referred to the process of taking a mass-produced item and making it yours through initials, a name or a date; usually in jewellery this has involved engraving or 'stamping'. However, customisation in the jewellery world refers to the customer taking a style of jewellery (ring, earring, etc) and adapting its components - metals, gemstones, pearls, etc - to make it suit their particular colour preferences. Why settle for something that isn’t right? Why is StyleRocks so different? StyleRocks is unique in that its customisation capabilities are unrivalled globally. By that, we mean that while others may offer 'customisation', it's limited usually to gemstone or metal. StyleRocks is the only website globally, which offers full service customisation capabilities - similar, or sometimes better, than what is offered at your traditional jeweller. How can you offer such high quality jewellery for a fraction of the retail jewellery price? We have a partnership directly with the manufacturer. No middlemen here. StyleRocks gives you top-quality jewellery at a fraction of the retail price because we’re partners with Australia’s largest jewellery manufacturer. To fully understand how this benefits you, let’s take a look at the way jewelry customization usually works. Usually when visiting your retail jeweller, the choice of jewellery available to you is limited, as they have to carry inventory. They may offer an item in perhaps 2 different metals and a few different kind of gemstones. Of course, this works for many people if they like what’s on offer. We’ve solved these issues for you. Because you design online at StyleRocks using the many choices available, you’re now in control of your customised jewellery – at a fraction of the price, because we’ve been able to cut out the middleman.